The Teatro Colon is a famous opera house located in Buenos Aires, Argentina. Luigi once visited it during the events of the game Mario is Missing!. He found out that a flute from the Teatro Colon was stolen by Koopa Troopas. His task was to find and return the flute to the opera. Upon completing this task he was awarded 1,710 dollars. The Teatro Colon is considered one of the world's most beautiful opera houses. It is also famous for its wonderful acoustics, or sound system. It was built in 1908. 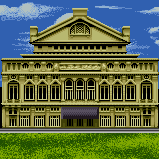 The stage can hold six hundred performers and is longer than one city block! The theater is very fancy, with its huge chandeliers, red and gold box seats, and soft red upholstery. Besides opera, the Colon is home to the National Ballet and National Symphony companies. This page was last edited on March 29, 2018, at 18:40.